If I think about it too much, Thanksgiving is depressing. It's a holiday to commemorate the coming together of the white folks and the American Indians. But that coming together led to so much subjugation and destruction. It's hard for me to stomach. But on the other hand, I do like the idea of a national holiday centered on appreciation. It's so easy to get caught up in the go-go-go of daily life and forget to stop and appreciate what is right in front of us. So in the spirit of the happy side of Thanksgiving, I want to share my appreciation with all of you. It's so fun to make new connections with like-minded folks across the world who are committed to meaningful and memorable weddings in an eco-friendly, hand-crafted, budget-minded way. I love the insights that you share with me via e-mail and the comments section. Hooray! 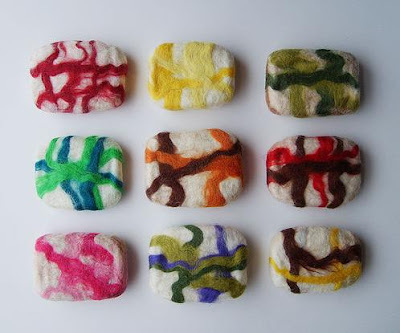 My virtual gift to you is a set of directions for making felted soap. Our dear friend, Shelley, made some for Matt's birthday (see below), and the idea is very practical and inspiring. The felt acts as a built-in washcloth. It's relatively easy to make and definitely unique. Thank you for the virtual gift! Since I took the handmade pledge I was looking for a unique handmade project that wouldn't take too much skill. I ordered $20 worth of wool roving through Mielke's Fiber Arts and it came in 3 days, bought 24 bars of italian soap from Ross for less than $20. Slowly making the soap, which isn't as easy as it looks. Each bar takes about 15 minutes of squishing and hard rubbing on a washboard. I have 12 done and 12 more to go. That is 24 gifts for $40!! Thank you for the hot tip! !